——————————————————————————————–The San Antonio Astronomy Association is proud to announce the creation of an official marker to commemorate a signficant event in the annals of science in the region. Persons with a vested interest in the history of the State of Texas and astronomy in general are invited to attend this occasion. LOCATION: The Bullis House Inn , 621 Pierce Avenue, San Antonio, Texas. This is a bed and breakfast hotel where participants can stay if they like. Call 1.877.4774100 or 210.2239426 for reservations. 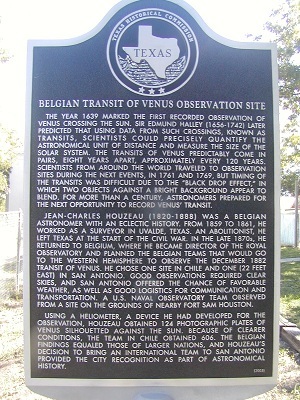 WHAT WILL HAPPEN: Installation of a Texas Historical Marker commemorating the Transit of Venus observations made by a team of Belgian astronomers led by Jean-Charles Houzeau of the Royal Observatory in 1882, one of the more remarkable men of his time. The owners of the Bullis House Inn, Alma and Steve Cross, have gratiously allowed us to install the marker on their property very close to the original spot where the observation was made. This is a largely unknown chapter in Texas history. Map 1: Overall location of the Historical marker with respect to major highways. Map 2: The Bullis House Inn is marked by the small red star on this map. It is about 20 minutes driving time from the San Antonio airport. Note the site of the U.S.Naval Observatory transit expedition (see end of this web page). 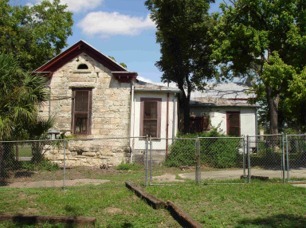 The Bullis House Inn occupies nearly a full city block in the city of San Antonio. In 1882 this was the site for a team of sky watchers from Belgium who observed one of two passages of the planet Venus across the sun in an attempt to define the earth-sun distance. 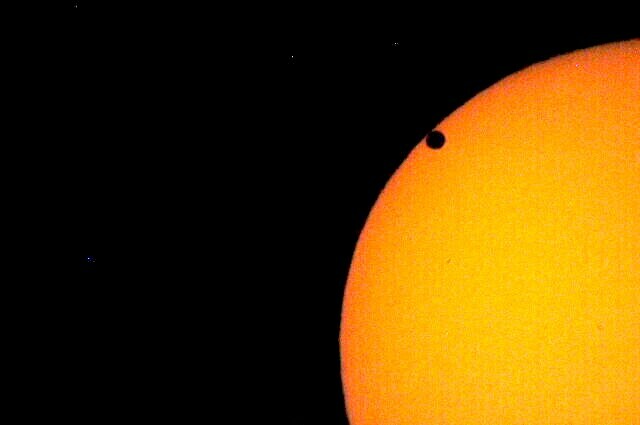 As the round image of Venus appears to move across the sun’s disc from left to right, an unusual phenonmenon called the “black drop” effect occurs. This was recorded by E.Stuyvaert during the late morning of December 6, 1882 on his drawing pad. Note also the ring of light surrounding the Venus image in the last frame 22.One of the goals of astronomers of the 18th and 19th centuries was to compute the distance from the earth to the sun (called the Astronomical Unit [AU]) or the solar parallax, being the angular diameter of the earth’s semi-major equatorial axis as seen from the sun’s center. The AU is the baseline for stellar parallax determinations, and first step of the cosmic distance scale. The famous astronomer Edmund Halley figured that to determine this unit, the transit of Venus had to be observed from widely distant locations on earth. He proposed to measure the time of duration of the transit; others suggested to determine ingress or egress times, or precise measurements of the location of Venus on the solar disk, in order to calculate the value of the solar parallax. 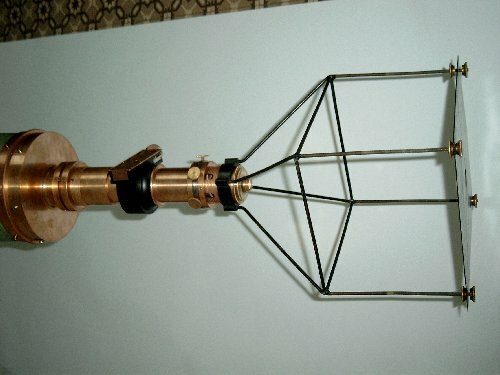 Two methods were devised to measure solar parallax during this era. 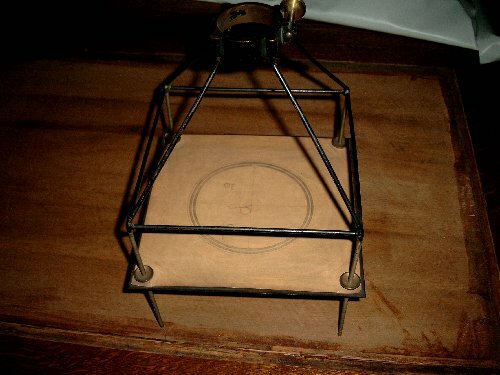 One was to use a heliometer to measure the distance between the limbs of Venus and the sun during the whole time that the planet was seen projected on the solar disk, and the other was to take photographs of the sun during the period of the transit and subsequently measure the negatives. San Antonio, Texas was a rather unlikely location for an international astronomical expedition from Belgium undertaken to observe the Transit of Venus on December 6, 1882. This expedition was led by the Belgian astronomer Jean Charles Houzeau of the Royal Observatory. He had lived in San Antonio for many years before returning to Belgium and was familiar with it as a potential observing spot. Two Belgian expeditions observed the Venus transit of 1882, the first went to Chile, the second to San Antonio, Texas, to observe the transit from both southern and northern hemisphere sites, in order to find the parallactic displacement of Venus on the solar disk. Both parties were equipped with identical instruments, so-called “heliometers with unequal objectives”. This special arrangement, invented by Jean-Charles Houzeau, director of the Brussels Royal Observatory, consists of two semi-circle-shaped lenses of different diameters and focal lengths, which could be moved relative to each other by a micrometer. They produced a large and a small image of the sun, plus a large and a small image of Venus. The trick was to shift the two lenses of such a heliometer so that the small image of the sun, produced by the short-focus lens, coincided with the dark large image of Venus projected on the very large image of the sun, and to read the heliometer setting. Jean-Charles Houzeau himself headed the “Texas” party, which suffered from clouds during the early portion. Other members of his team included Albert-Benoit Lancaster (1849-1908), meteorological inspector,and Charles-Emile Stuyvaert (1851-1908), assistant astronomer. 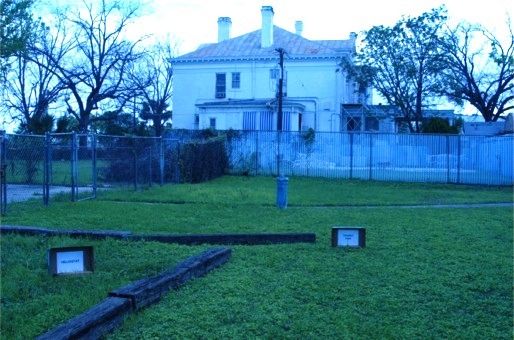 Houzeau rented a house in the Government Hill district across the street from Fort Sam Houston. . According to Houzeau’s survey his telescope piers were located 195 meters south, 289 meters west of the Quadrangle Tower– the main feature of the fort. Only about half of the transit could be observed, and 124 measurements were completed. Houzeau [see: Houzeau, J. C. 1884, Passage de Vénus du 6 Décembre 1882, Annales de l’Observatoire Royal de Bruxelles, N. S., Tome V., premier fasc.] published the report of the campaign and revealed his final result of 8.911±0.084 arseconds for the value of the solar parallax. He wanted a more precise value but blamed the larger than expected error on the poor sky conditions in San Antonio. Houzeau further commented that after the haphazard results of the various international expeditions for the transit that occurred 8 years beofre, his approach to the problem was at least a uniquely fresh method to observe a Venus transit. Platte of house Houzeau rented (upper left) and survey of the site made by Houzeau.The outline of the house where Houzeau made his famous observation has 4 bedrooms, verandas front and back, and a kitchen. Although the house is gone now there is a small rock house in its place that has a similar outline. 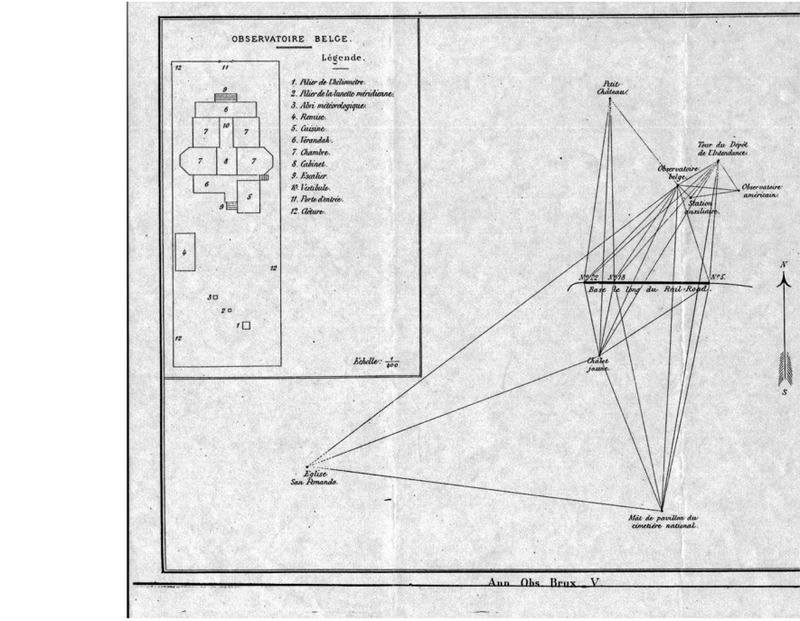 The rest of this figure shows the survey Houzeau made using key landmarks in the city such as the San Fernando Cathedral and National Cemetery. 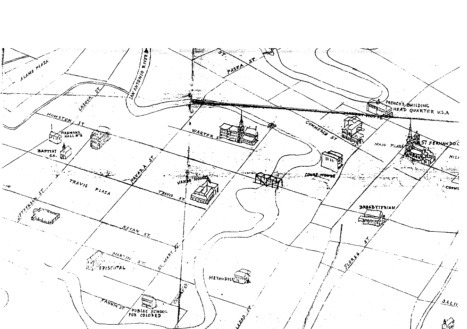 A baseline was created from a rail line that still exists. 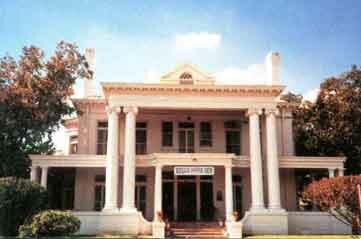 The Tour du Depot is the Quadrangle tower built in 1876 that is the principal landmark at Fort Sam Houston. Note on the far right the lines converge to identify the location of the American expedition situated just 500 meters to the east on the grounds of Fort Sam Houston. The role of the auxiliary station marked on the survey is not understood. Locations surveyed by the author and R. Frankenberger in 2004 showing the sites of the heliometer pier (we identified by a small sign on the ground in the front of the picture labeled ‘transit pier’) and the meridian telescope pier (behind the nearest marker on the ground). The two upright signs should have been switched before the photo was taken; both sites were located with GPS based on descriptions from the 1882 survey. Across the street in the background is a now abandoned convenience store which was in 1990 believed to be the Houzeau observation site. However, our more recent survey negates that idea. This view is to the northwest. The equipment was located to the south of the house which confirms his ability to view the transit. Photo R. Frankenberger. A view to the east showing the Inn and the location of the instruments. Photo R. Frankenberger. 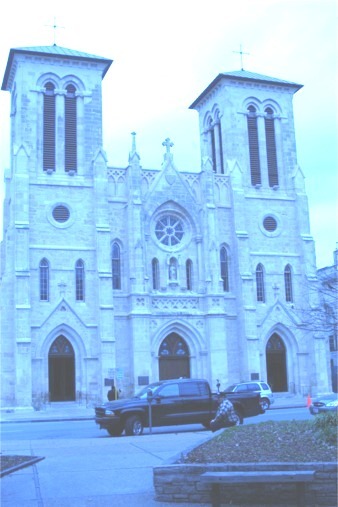 One of the key markers in Houzeau’s survey of his observation site was the San Fernando Cathedral. Located in downtown about 2 miles away, it can no longer be seen from the site due to the city buildings. P.Maley photo. Closeup of one wall of the rock house. 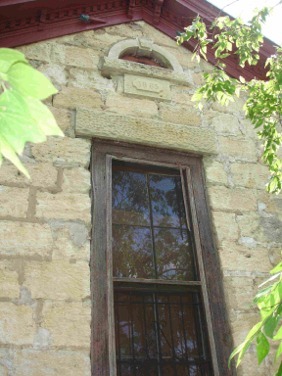 The date 1885 is etched in the arch above the window indicating the house was definitely built more than 2 years after Houzeau observed from there. Photo R. Frankenberger. A view to the south revealing the front of the house. The veranda is partly coincident with the design of the house which Houzeau used. On Dec. 6, 1882 the Sun and Venus would have appeared in the top most part of the photo near the end of the transit. Photo R. Frankenberger. A view to the north. Houzeau’s weather instruments would have been positioned in the left part of the frame. The large trees were not present in 1882. Photo R. Frankenberger. The following account was written by Don Finley of the San Antonio Express in 2004. “Jean-Charles Houzeau slipped on a yellow shirt, a blue sombrero and red-and-white striped trousers, introduced himself as Carlos Uso and bribed members of a Mexican wagon team to get him out of San Antonio and across the border. Houzeau was on the run. The Confederate authorities were conscripting every able-bodied man they could find and had offered to make the Belgian astronomer an officer. He told them he’d rather cut off his right hand. Jean-Charles Houzeau (1820-1888) as seen in later life.A passionate abolitionist, Houzeau for five years had earned a living as a surveyor and essayist in San Antonio while secretly helping slaves and Union sympathizers flee to the North. After assisting a Unionist named Charles Anderson escape jail, Houzeau was facing arrest himself. As he left, he vowed never to return: “Texas was closed to me forever, even if the North won the war and peace were restored; the party vengeance in these semidesert, semi-savage regions is both too implacable and too easily executed with impunity,” he wrote. But he did return. 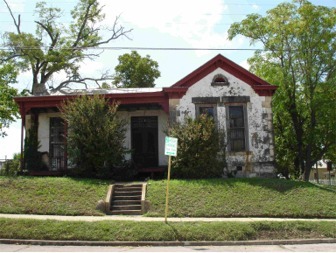 In a little-known chapter of San Antonio history, Houzeau came back to the city in late 1882 and set up an observatory at a small house at Palmetto Avenue and Grayson Street. There, he observed and recorded a rare celestial phenomenon — the visible passage of Venus across the face of the sun. By any standard, Houzeau led a colorful life. Born to an aristocratic family, he scandalized his wealthy peers in Brussels with his marriage to a servant. But the marriage was in keeping with Houzeau’s passionate views on social and racial equality, which were radical for his time. After publishing those views in various magazines, he was fired from the Royal Observatory. Leaving his wife behind, he traveled to America in 1857 on an emigrant ship so wretched that its passengers were fed pea soup and scraps from the crew’s table, according to a 1990 biography in Sky & Telescope magazine by David S. Evans, professor emeritus of astronomy at the University of Texas at Austin. He could have afforded better transportation, but the company was in keeping with his politics. The ship docked in New Orleans, and Houzeau caught a wagon train to San Antonio. He worked as a surveyor, continued his studies of the heavens and wrote articles on American life for European publications. At one point he lived in Uvalde until a series of Indian raids forced the evacuation of the town. Houzeau’s survey of San Antonio 1882After he fled San Antonio in 1861, he moved to New Orleans — by then under federal control. He earned a living for a time writing for a French-language newspaper, L’Union. When that publication went out of business, he became managing editor of the New Orleans Tribune — the first black-owned daily in the United States. He was a leading voice for civil rights during Reconstruction. Houzeau was dark-skinned — which had allowed him to pass as Hispanic when he fled San Antonio — and many believed the powerful editor of the Tribune was part black. Houzeau didn’t discourage such speculation. Differences with the newspaper’s owners led him to quit and move to a banana plantation in Jamaica, where he adopted two black children and wrote books. Later, overriding the protests of advisers who disapproved of his republican politics, the King of Belgium named Houzeau director of the Royal Observatory. The idea to use the transit of Venus to triangulate the Earth-sun distance, known as the solar parallax, belonged to Edmund Halley (discoverer of Halley’s Comet), who by then had died. Several teams of astronomers traveled to points throughout the world — including two Belgian teams, one in San Antonio and the other in Santiago, Chile. 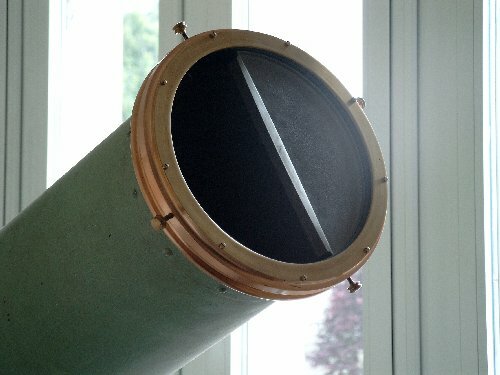 The heliometer developed by Houzeau still exists and was refurbished and shown to the public on June 8, 2004 in Belgium to celebrate the first Transit of Venus to occur since 1882. The structure of the solar telescope. Photo J.Cuypers. The uniquely designed split objective lens. Photo J.Cuypers. The support structure for the image projection device. Photo J.Cuypers. 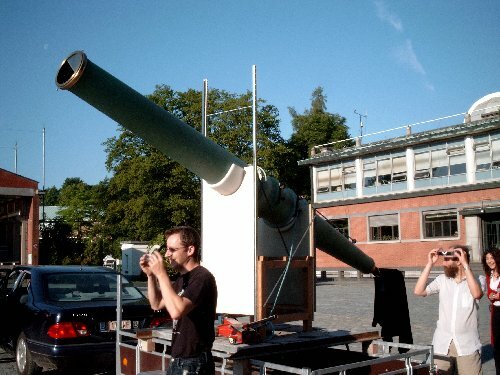 The heliometer displayed outdoors on June 8, 2004. Photo J.Cuypers. The Texas historical marker was approved in 2005 by the Texas Historical Commission based on data supplied by this author. 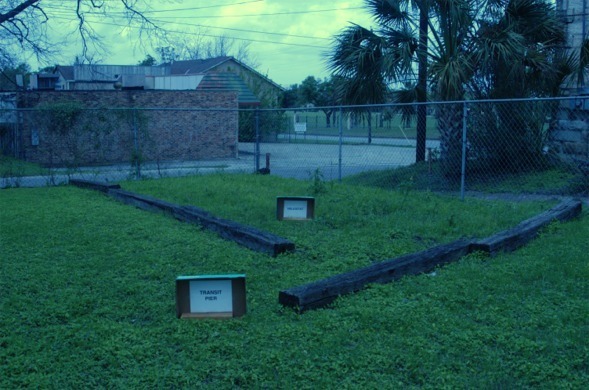 Funds were raised by the San Antonio Astronomy Association which paid for the casting and shipping of the marker to San Antonio. The actual marker received from the manufacturer before installation. Photo by Bryan Tobias.Monuments to past expeditions of Transits of Venus in the 18th and 19th centuries are few and far between. We felt that it was most important to acknowledge this scientific event so that future generations of young people will be able to know with certainty that Texas does have an astronomical history. 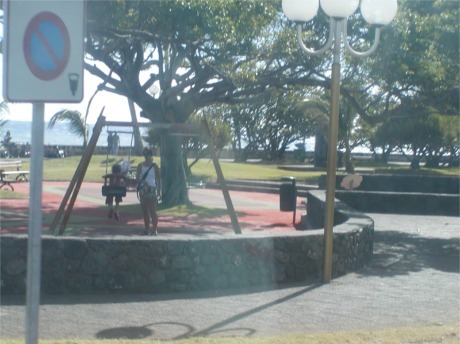 Historical marker on the island of Rodrigues, Indian Ocean as photgraphed by the author in June 2004. Contrast this marker with that of the Texas marker above. 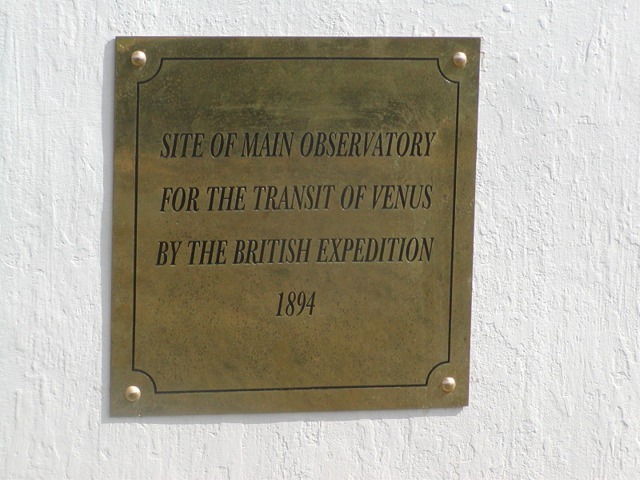 Unfortunately this marker was actually found to be in the wrong location but still honors one of the British teams who observed the Transit of Venus from that remote location. 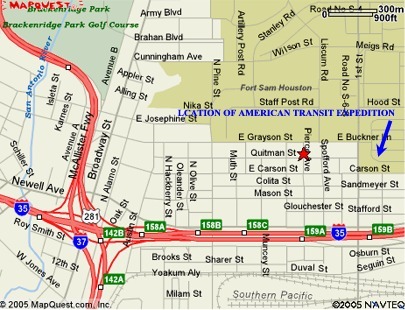 In addition the date of the marker is not the date of the Transit (it was 1874). The previous night the equipment was readied and on December 5 there was a bit of cirrus in the sky but otherwise it was generally clear. It was the usual clouds from the southeast (Gulf of Mexico) that swarmed in the following morning around 5.30am that caused the greatest alarm. But at 6.15am Houzeau walked down to the U.S. Naval Observatory site and compared chronometers. 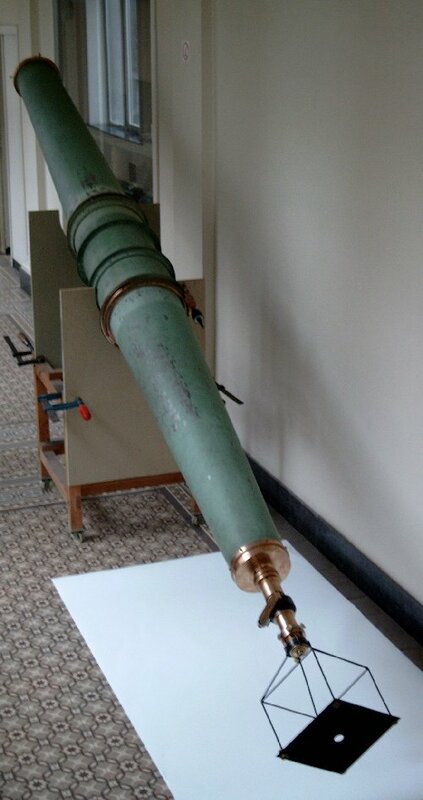 On transit day Houzeau used a 110mm aperture Merz refractor at 125x, while Lancaster was the heliometer operator. This device was equatorially mounted. It has a 0.18m (about 7 inches) aperture and 4.3m focal length (about 170 inches). Stuyvaert used a Fraunhofer refractor of 75mm aperture at 90x. David Haynes located the account produced in the San Antonio newspaper on December 7, 1882. Some of this account is generally factual but many details are missing and some are simply inaccurate. The newspaper reported that Houzeau was delighted with the results of his observations in spite of the fact that he regretted deeply that he had lost the first external contact at 7.29am and also the first internal contact taking place at 7.50am; as soon as opportunity arrived with his assistants he went immediately to work engaging his special heliometer. His work consisted entirely of measurements. At about 9.30am Houzeau got his first glimpse of the sun. The sky continued to clear until about noon all the clouds had disappeared from the region of the sun, and from that time until 1.36pm when the transit terminated Houzeau and his team was most successful. The last two glimpses of Venus occurred at 1.14 and 1.34pm. As you can see from the image below, Venus has such a large diameter that it takes quite a while to pass completely off the sun’s disc. Unfortunately no photgraphs were taken of the 1882 expedition or the site that survived the time. While you are attending the ceremony, take the time to stop by and view the marker for the United States Naval Observatory expedition 500 meters east on the grounds of the U.S. Army facility at Fort Sam Houston. Here is the location map. Access is restricted to specific gates. The closest one is on Walters St which is an exit off Hwy. 35. Follow Walters St. to the north to the gate. Be prepared to show identification.